I didn’t know what a QR code was until last week, well I knew what they were, I just didn’t know they had a name! A QR code is one of those funny little square codes for scanning that pop up every where these days. A couple of weeks ago I saw an intriguing little cross-stitch which is a freebie on the facebook page of the Embroiderers Guild of Victoria. 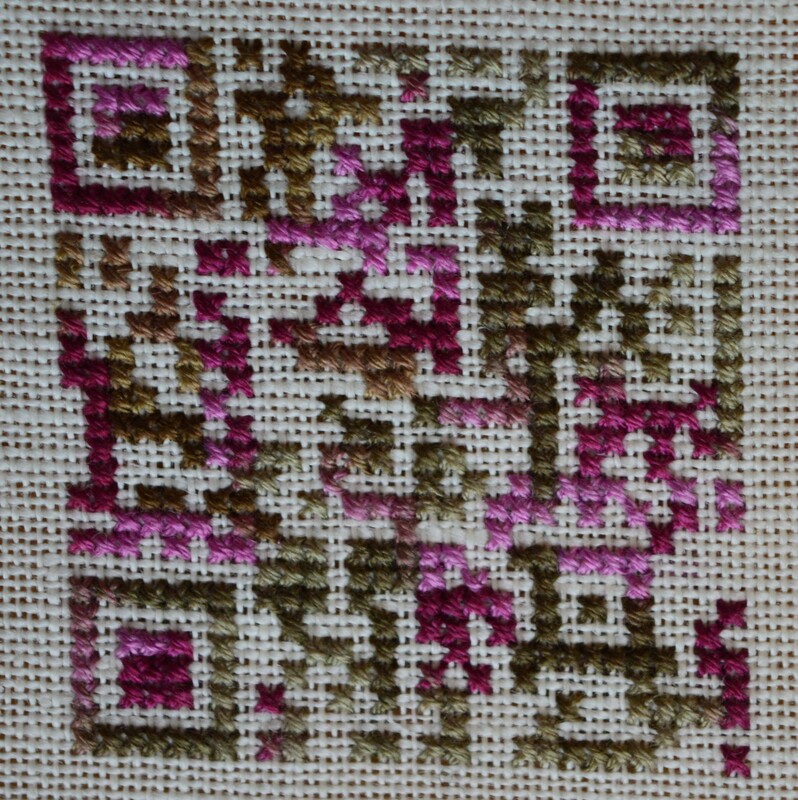 It’s a cross-stitch of the QR code for Love is patient, Love is kind. It looked a pretty quick stitch and although I wasn’t convinced it would work, I rather liked the idea of being able to scan a cross-stitch. It didn’t take long to stitch at all, I used one of my favourite DMC variegated threads which has soft shades of green and purple. I was very careful not to have a stitch wrong, I’m not sure how these codes work, I wouldn’t like to be one stitch out and end up with Fifty Shades! Having stitched it I had to try it out! This was a bit of a learning curve, I had to find an app for my phone, download it and then work out how to use it! To my amazement it worked! Well it worked the first time, I couldn’t replicate it to show my OH! 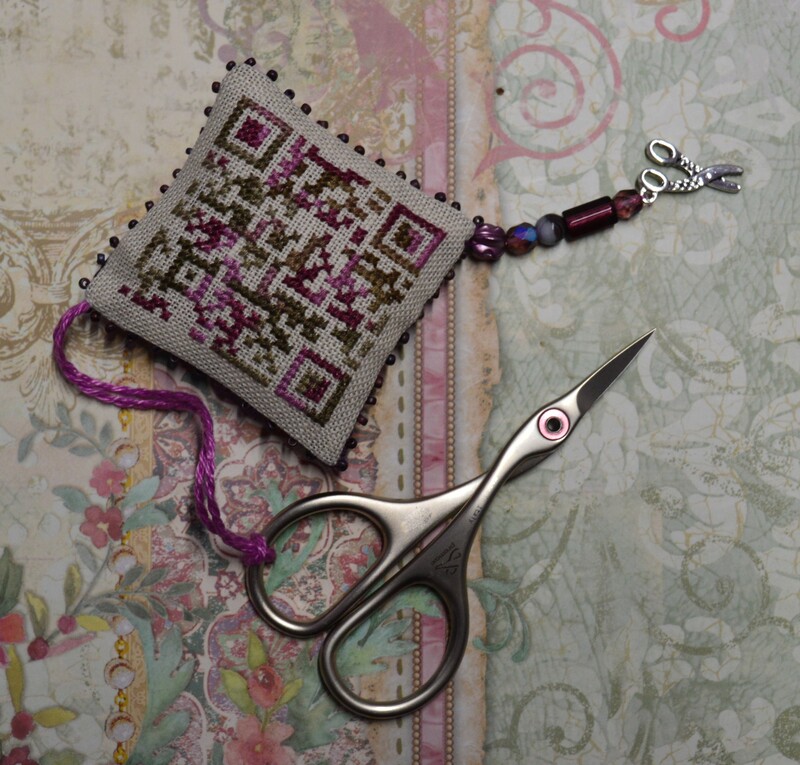 I decided to make it into a scissor fob, it’s about the right size and I’ve also just treated myself to some new embroidery scissors from a quilters destashing group (a dangerous page to be on!!) They are made by Premax, I loved the shape of them and they are a lovely weight to use too. I found some co-ordinating purple cotton for the back, I added the beads round the edge and then made a length of cord from perle thread. I did get in a bit of a pickle putting the cord in as I forgot it was easier to put it in before you stitch the bottom up, so I was trying to thread it in with a large needle from corner to corner. After much faddling about I undid a few stitches and pushed the knots in! This time the Zoe SAL, as it’s called, will make an embroidered box, the list of threads includes my favourite thread above so we’re onto a good start! The patterns will be released every couple of weeks starting in mid April, Faby usually plans it pretty well in that the amount to be stitched can comfortably be completed in the two weeks. So if any one fancies joining me with the Zoe SAL, just follow the link to Faby’s site. This entry was posted in embroidery, Stitch-a-long and tagged #ZoeSAL, Cross-stitch smalls, Faby Reilly Designs. Bookmark the permalink. Love the QR stitch. I couldn’t get the first picture to scan but the second one, showing the fob, worked perfectly. I was able to get the code to read, but not consistently. I think it works more reliably if the code is black on white, but readers also tend to be fussy to start with. The poppy oranment is really nice. Have signed up for the SAL — thanks for that, it looks wonderful and I really enjoyed the Christie SAL. I’m hoping I have most of the threads in stash, but where did you find platinum 32ct Belfast linen? Or are you, in your usual style, using another colour? The searches don’t seem to work on the sew & so site, even with the product code! My husband had surgery last week and they gave me a QR code to use, to let me know what stage he was in the whole procedure! All your work is so pretty! Wow! I didn’t know they could be used like that! The QR code thing is so cool!!! I think I’m going to try to make some for my friends with businesses! Oh no, the stich along sounds great – but with my sensible head on I will have to miss out as I already have so many projects to finish off!